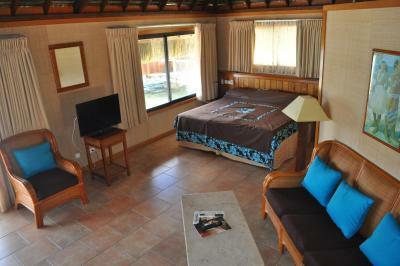 Lock in a great price for Hotel Royal Huahine – rated 8.3 by recent guests! If you want to get away in paradise this is the place. From the airport you need to arrange with the hotel a shuttle to a hotel boat shuttle. Once on the boat it is another twenty minutes to get to the resort. We were greeted with beautifully garnished fruit drinks. The people at the desk are like your mom, if you need something they will help to figure it out. The grounds are beautiful and coral all over in the ocean. 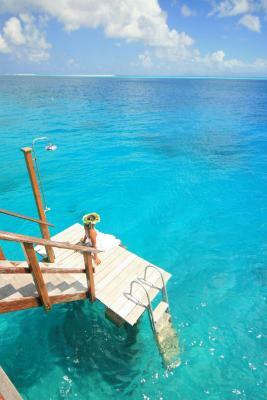 If you can stay in an over the water bungalow. Who needs air conditioning, which they have when you can just in off our own private dock and swim and snorkel. Bring bread from your meal to feed the fish, especially at night. Turn your outside spot light on and the fish that come are amazing and memorable. You are remote, there is one restaurant with limited hours for each meal. The food is delicious! These bungalows are the most affordable ones that we researched in the Society Islands, so we gave it a try. We liked how peaceful it is to wake up to the ocean. Room is spacious. The boat transfers are limited in frequency, but provides the convenience to get to downtown Huahine. Food is reasonably priced and delicious at the hotel. Over water bungalows were great, quite large with plenty of outdoor space. Staff was very friendly and the cabins were wonderful over water. 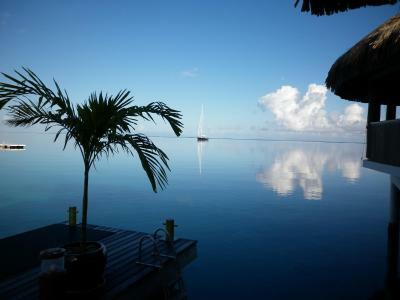 Amazing view from the bungalow over the water. Great staff! The bungalow was superb. Every detail was taken care of. The staff is more than happy helping in any circumstance. Great place and wonderfull people!!!! Looked pretty in the location, clean, with large bungalows. Also very friendly staff. With the free kayak you can snorkel to a motu, great snorkling! Food is also fine. Overwater bungalows were very spacious. The staff was extremely helpful and friendly in organizing day trips and also travel to and from the resort. 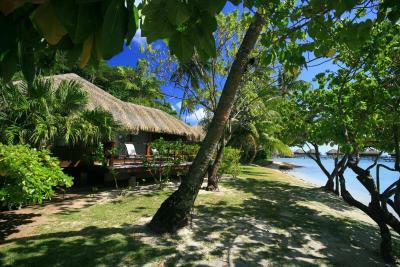 It’s secluded, so there’s not much going on, but it’s a great location to unwind on Huahine for a few days. 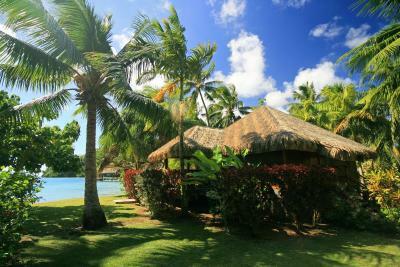 Hotel Royal Huahine This rating is a reflection of how the property compares to the industry standard when it comes to price, facilities and services available. It's based on a self-evaluation by the property. Use this rating to help choose your stay! 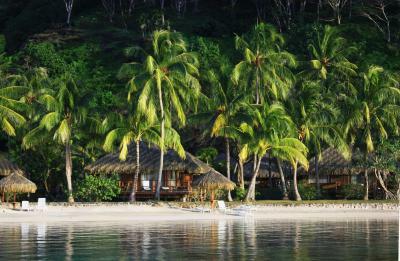 Only accessible by boat, Hotel Royal Huahine features a private beach, outdoor pool, restaurant and bar. 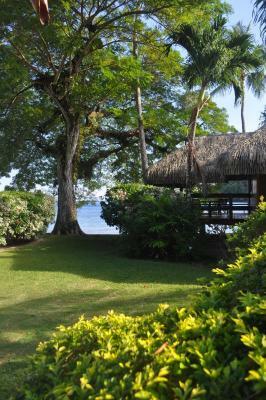 Some bungalows are located over the water with a spacious sundeck and direct lagoon access. 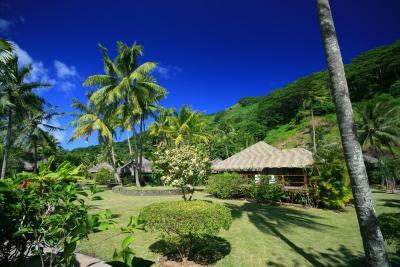 Each bungalow at Hotel Royal Huahine has views of the gardens, beach, lagoon or nearby islands. All feature air conditioning, ceiling fans, mini-bar and TV. Some also include a bathtub. Guests receive free boat transfers to and from Fare village. 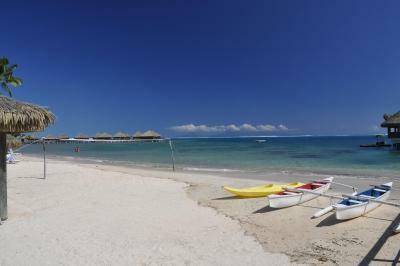 Free activities include snorkeling, kayaking, canoeing, table tennis, beach volleyball and local cultural activities. 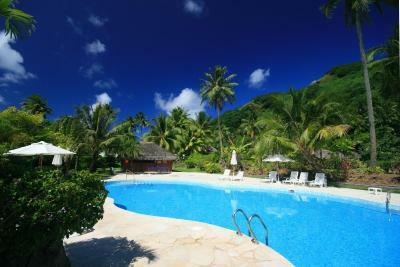 When would you like to stay at Hotel Royal Huahine? This bungalow offers lovely garden views. 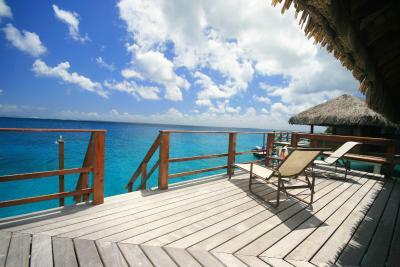 This bungalow features a bathtub and a spacious patio with direct access to the lagoon. 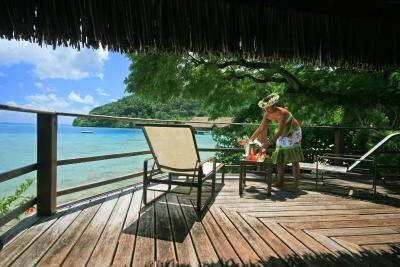 House Rules Hotel Royal Huahine takes special requests – add in the next step! Any additional older children or adults are charged XPF 4900 per night for extra beds. 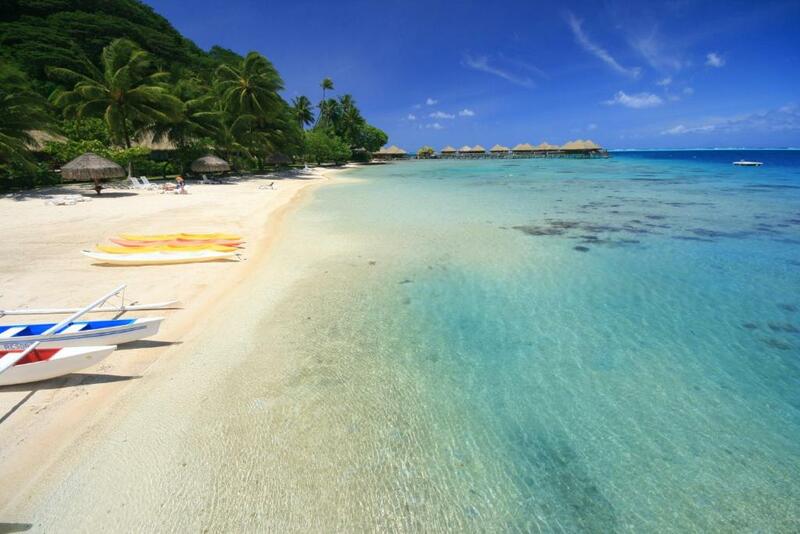 Hotel Royal Huahine accepts these cards and reserves the right to temporarily hold an amount prior to arrival. 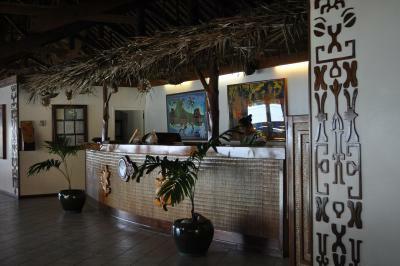 Please note that Hotel Royal Huahine requires a credit card authorization form to be completed upon check in. Airport shuttle can be arranged for an extra fee. Reservation is needed. Please note that this property is only accessible by boat. Shuttle boat departure times are 8:30, 9:30, 11:30, 13:30 and 15:30. For more information please contact the property using the contact details found on the booking confirmation. It is great as it is considering the price level, but may be would deserve some remodeling to get back its luxury original status. May be the only thing that really need to be changed are the beach chairs. Besides that, we loved the place. When you check in there is a sign listing this resort as a three star hotel. You will not have the latest and greatest at a three star hotel. Once you get over that this place is a beautiful place to stay. Some things in the spacious bungalow is not perfect, but is functionable. If you want perfect pay to stay at a five star resort. The money I have spent on this hotel is only just for the location setting. It is unreachable by car, so there is a free shuttle boat JUST 3 times daily which the timing is not convenient at all. You can arrange with the Capitan at an extra cost.. but for the money you’ve paid.. it’s not enough. Staff are nice but they have no idea of Customerservice. The bath tub & refrigerator were not working properly. No one came to fix them after I’ve informed them. They don’t come immediately or they don’t come at all, if there is a problem or left the beach towels at the desk. Beautiful setting, paradise location. Staff were helpful, sometimes. Tranquility! Even the occasional rain...we were here after all in the rainy season, wasn't enough to distract from the splendour of this hotel. A fantastic location. We were upgraded to over water bungalows, which were palatial. The hotel was very quiet, so we received very friendly and personal service. 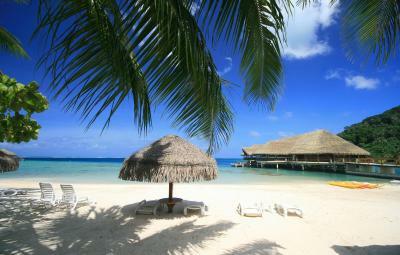 We have had a wonderful time...the best of our stay in French Polynesia. We took the lagoon tour.....taking us almost around the whole island, which was fabulous. Really nice place checked in on off hours they sent boat to pick up just wife and I then upgraded our room. Good food at restaurant, the place is very clean nice snorkeling. Would highly recommend. The bed sheets are the worst, it's so worn out and rough that it was hard to fall asleep at night, I had to wrap myself in my own blanket. Lots of mosquitoes. Also, I wish they gave more information on tours when we arrive. The tap water for shower tasted salty (which wasn't the case in Bora Bora and Maupiti). The tap water is officially drinkable, but tastes so aweful that we didn't even use it for tea and coffee. Even after showering, we always felt a bit sticky still. The tap water still seems to have a high salt content. We recommend stocking up on mineral water in Fare, where 1.5 liters cost 100 XPF, compared to 350 XPF for 1 liter in the resort. We didn’t speak French So communication was a problem. Internet availability on in the reception area was inconvenient. The first day or two the water in the shower smelled of sulfur. The bathroom toilet room smelled of urine through our stay. Food menu needs flexibly. Need umbrellas by the doors of each room. When it rained there was no way to get the reception area. that we had to leave. yes, if you want to find mistakes, they were there. It is all about the priorities. Not working safe cannot distract me from enjoying such a wonderful location and nature. We have had an awesome holiday there. It is so quiet, relaxed and beautiful place. It is only accessible by boat which means no road, no traffic, people etc. You just watch locals on their boats. 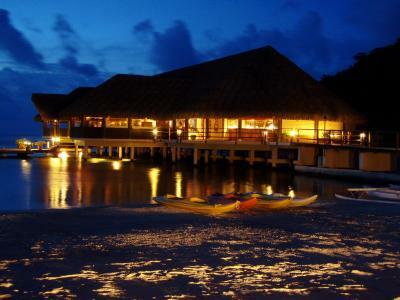 :-) I really recommend overwater bungalow. It is like must there. You can have nice swim or jump to water from your deck :-) Customers' reviews said it is tired. Well, yes. 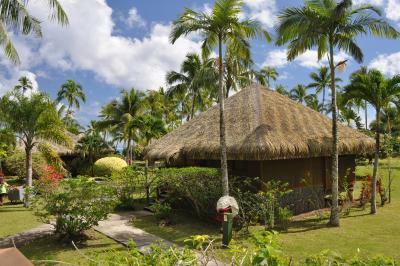 Royal Huahine is for me authentic Polynesian hotel. And it is a 3 star property, so it is not really fair I guess to compare it with 4 or 5 stars chain hotels just because it offers overwater bungalows... And let's be honest, it was more affordable than the others. If you are after new, modern, luxury or shiny place go somewhere else. 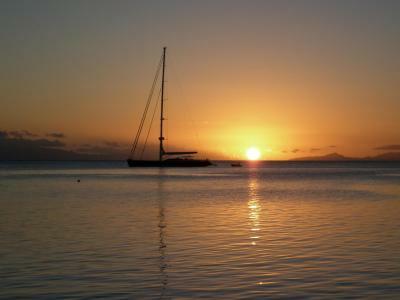 Royal Huahine is hidden peaceful place. Place where you can really relax, see amazing sunsets, and simply just enjoy a day and slow down your live. Staff is experienced and local. Reception can book you day tours, it was very convenient. Or if you want to go to Fare during a day, take a boat. They will explain all necessary details to you. You will find there supermarket or some food kiosks, so you might have a lunch or buy the water there. I liked dinner in restaurant and as well that menu was "easy". 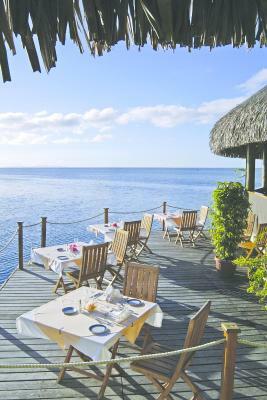 I think prices were the same as in other restaurants in Moorea. Yes, there is no other option where to eat your dinner. So what? And I was super happy that wifi was not in bungalow. 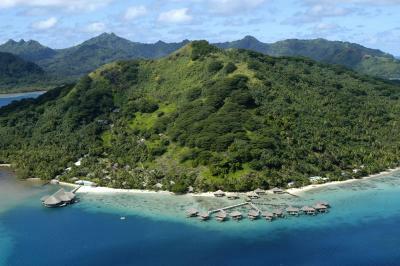 Thanks for that Royal Huahine! No worries, it worked very well at reception. Bungalow was super spacious,especially bathroom and deck was awesome. So spacious, with sitting and with sun chairs. And small roof, so if it is too hot, you have a shadow there, or good to hide when it is raining. This is important, because in overwater bungalow you spend your day almost all the time on your deck. Not hanging around hotel. You can tell, that when hotel was designed, they did not need to build a lot of bungalows to pack it with people. They built bungalows for people. 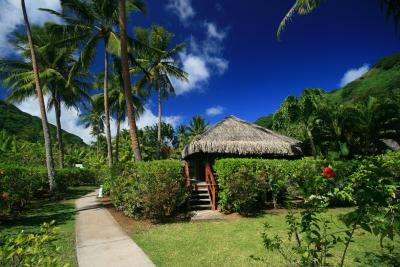 The beautiful sea bungalows are so secluded and restful. We snorkled around them and saw such amazing life, inclusing a beautiful baby manta ray. Their local cats are absolutely gorgeous and they come sit on your lap as you read or admire the sea. The housekeeping staff didn't pay much attention to the "no servicing required" sign - they would come into the room regardless. Whilst this ensured a spotlessly clean bungalow, oddly enough the soap and shampoo dispensers were never refilled during our 6-night stay. Also, on one occasion the staff had evidently started to make the bed, then must have been distracted and forgot to complete the job, leaving a weird-looking half-made bed which we trusted was clean. We had a spa tub in the room as well, but unfortunately the water jets didn't work. All in all though, these were minor issues that didn't really detract from what was a truly fantastic stay. Idyllic, remote location only reachable by a 20-minute speedboat transfer. 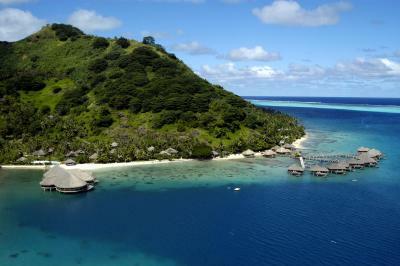 If you're looking for a quiet, relaxing and easily affordable French Polynesian paradise with postcard-worthy sunset views (over nearby Ra'iatea and Taha'a) then this is your place to get away from life for a while - if you're after a bustling tourist trap or family-heavy places, then maybe consider Bora Bora or Moorea instead. Not saying Royal Huahine doesn't cater to families, it's just more set up for those who want a quieter, stress-free destination. We were fortunate enough to stay in an overwater bungalow - stepping off our own private balcony into the incredible blue waters of the Huahine lagoon to snorkel with fish and coral was a magical experience. The bungalow was spacious with a big comfortable bed, plenty of sun-lounging deck space, walk-in closet/storage and a big bathroom with a tub and separate shower with good water pressure/temperatures. Staff were friendly and informative, the resort's general manager even came out to personally greet us for the transfer from Fare airport. Tours were easily organised through reception staff and could be customised to our needs, which was nice. The local beach and surrounding bay area was great for kayaking and snorkelling - lots of different species of fish, and they didn't seem to mind people swimming with them. Even saw a manta ray in the deeper water just out from the overwater bungalows. A couple of counter-thoughts to some reviews we read prior to our stay: looks like the resort has been serious with addressing some reviewers' gripes about looking tired, as certain facilities e.g. pool loungers, table tennis setup, boardwalks etc looked markedly newer than we had seen in older pictures. I’m a solo female traveller and the hotel forget to collect me so I stood alone in the dark on the tarmac as they locked up the airport for the night. If I hadn’t spoken French and had a Tahitian SIM card I honestly don’t know what I’d have done. There was no way of knowing that the boat I got on was in fact the right one and it was a little frightening in the dark at the dock. They gave me the key to a fictitious bungalow so I walked around in the dark on my own looking for something that didn’t exist and when I went back the desk had closed so the night watchman let me into the bungalow I was supposed to be in but it meant I had no key to get in and out without leaving the door open. There were ants in the bed and the sheets stank of damp. They did upgrade me after this but if you think you’re going to get a fancy over-water bungalow you’ll be disappointed as they’re run-down, dated and shabby. It also took them my whole first morning to sort out the move. Their WiFi is absolutely dreadful and doesn’t extend to the bungalows. For the price you’re paying, there’s no excuse for there not to be good WiFi access, even if it’s not free. The restaurant menu is extremely limited and expensive, the cocktails are really poor and there’s absolutely nowhere else you can go for food in the area. The shuttle boat takes 20-25 mins, not 10, and doesn’t run very frequently. The island tour was run by a lovely man but was uninspiring and mostly involved us being dropped at different places to buy things. I wouldn’t recommend this place.